Jayco utilise the brilliant Fiat Ducato as the basis for this motorhome. Specifically built for motorhome conversion in Europe, the Ducato boosts a 4-cylinder, 3.0-litre intercooled turbo diesel engine. The engine, combined with a manual 6-speed gearbox, returns an impressive 115.5 kW and 400Nm at a very usable 1700 to 2500 rev range. The engine is Euro 4 compliant – meaning it’s as ‘clean’ as you’ll get here in Australia. The Ducato is a front wheel drive, features a wider track for improved stability and is delivered from Fiats factory less the roof and rear wall, making for an ideal starting point to build a motorhome. Front vision, over the snub nose, is excellent and the driving position and feel is reminiscent of many later models cars. You would be forgiven for forgetting that you are indeed driving a 26 foot motorhome – that’s how easy these things are to drive. Having said that, you will need an LR license to drive this motorhome due to the GVM being over 4.5 tonnes. The large rear view mirrors offer excellent vision for reversing and changing lanes; however the dash-mounted rear view camera should be consulted in tight situations. Being a 26 foot motorhome, Jayco use the Fiats stronger box section chassis, as well as lengthening it with an Alco chassis extension, which incorporates the dual wheels with independent suspension. Up front, you’ll get excellent steering response with McPherson Strut suspension, while stopping power is via four wheel disc brakes. Anti lock brakes, traction control as well as driver and passenger air bags are standard fare with this Ducato. Our test vehicle came equipped with an alloy bull bar, which would also help out with the fitting of extra driving lights if needed. Jayco have gone all-out with their new Optimum motorhome, which represents the top-of the-line in their ever expanding fleet. 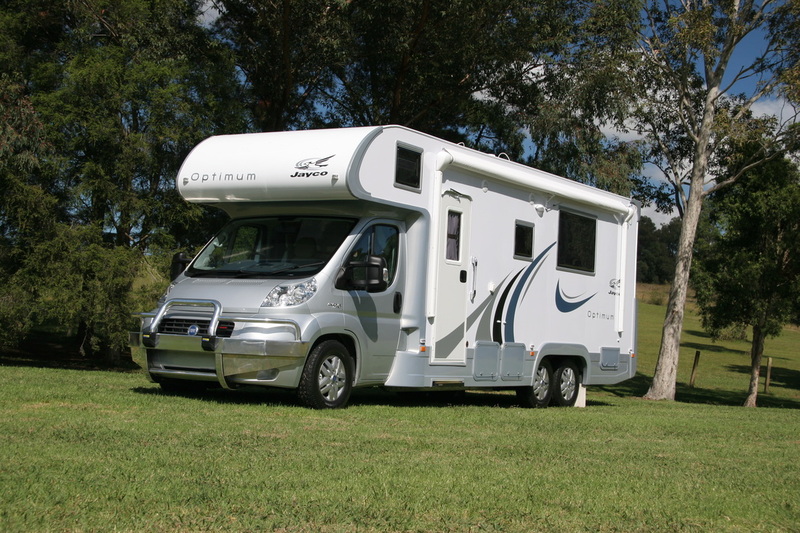 The classy-looking European Fiat body has been complimented with splashings of silver over the Australian built motorhome body. The corner mouldings (also colour-coded) and six alloy rims add to what makes for a luxurious- looking home on wheels. The high-roof line of the Optimum extends over and forward past the driver/passenger cab to allow extra sleeping above. The roof line remains at that height all the way to the rear, providing quite a large slab-sided-look to this motorhome. Both near and off side walls are broken up with plenty of tinted and double glazed windows. The full length awning is electrically operated from just inside the door – setting up your shade doesn’t get any easier than this! Also outside are speakers for the sound system, dual reversing cameras mounted high on the rear wall and illuminated grab handles for when returning to your home-away-from-home after sun down. This motorhome has a very low stance, which while great for on-road handling, is something you’d need to be on the look out for if driving over uneven surfaces – especially the long overhang. With a GVM of 5 tonne, a carrying capacity of 740kg and a braked towing capacity of 1200kg (taking into account the GCM should not exceed 6 tonne) you’ll need a Light Rigid (LR) license to call a 26 foot Optimum your own. The first thing you’ll notice about stepping into the forward positioned door is the slightly protruding door step, with yellow anti slip surface. Open the door and the 12-volt operated switch to slide the step out is within easy reach. Don’t be perturbed about driving away, forgetting to slide the step back in – it will retract automatically, then open up again once you have stopped, providing you haven’t turned the switch off from inside. Entering the 26 foot Optimum, you’ll be pleasantly surprised at how much room is afforded by the whole layout – which is partially enhanced by the excellent natural light afforded by the three overhead hatches and many tinted, double glazed windows. The near-side mounted cook top (three gas and one electric), with stainless steel overhead range hood and sink with drainer, sits opposite the 150L three way fridge freezer. A microwave rounds out the cooking section which should see no reason for not enjoying ones culinary delights while on the road. The East/West, extendable, queen size bed allows adequate room to pass through to the rear ensuite, which boosts not only a circular shower recess and separate toilet, but also a washing machine and heated towel rail. Now if that doesn’t warrant staying away from home more often than not, you’re a hard nomad to please! Lifting the gas strut assisted bed reveals the hot water system as well as the piping from the under-body-mounted diesel heater. There is also another flush fitting hatch under the bed that allows access to the two 100amp deep cycle batteries and water tanks, of which 160L is dedicated to fresh and 80L to grey waters. Pushing the bed back down, you’ll no doubt feel the softness of the pillow top inner spring mattress – just one of the many extra features you get by ticking the Optimum package. Some other internal standard extras are leather seats, remote controlled roof-mounted air conditioner, the larger 150L fridge, towel rail, twin house batteries and plethora of LED reading and ceiling lights. Entertainment is via a CD/DVD/MP3 player or a 19” LCD TV, which will pivot to allow viewing from either the bed or the dinette; albeit you’ll only be able to sit on the rearward facing pair of dinette seats to watch the TV. While these upright, leather clad seats are quite functional to hold extra passengers while in transit (seat belts are supplied for the forward facing passengers), they don’t provide the comfort of a dedicated, comfy lounge to flop into and relax. The Fiat Ducato motorhome is a brilliant base to build on. The Jayco Optimum provides 26 foot of everything you could reasonably want, except perhaps for a lounge suite, to motor around our countryside in relaxed, air conditioned comfort. You’ll stay clean with the amenities on board, that goes for your clothes too, and with the electrically operated awning and step, you could be forgiven in thinking you’re residing in a somewhat more expensive brand. Jayco Sydney can be contacted on Tel: (02) 9623 1971 and can be found at 63-67 Glossop St, St Marys. Thanks go Richard Welch, of Jayco Sydney, on the day of the photo shoot. Not only does Richard do the hand overs for most van and motorhome sales, he is said to be able to show an extremely clean set of heals with his racing drag bikes down the quarter mile strips around Australia. Go Richard, give ‘em heaps.